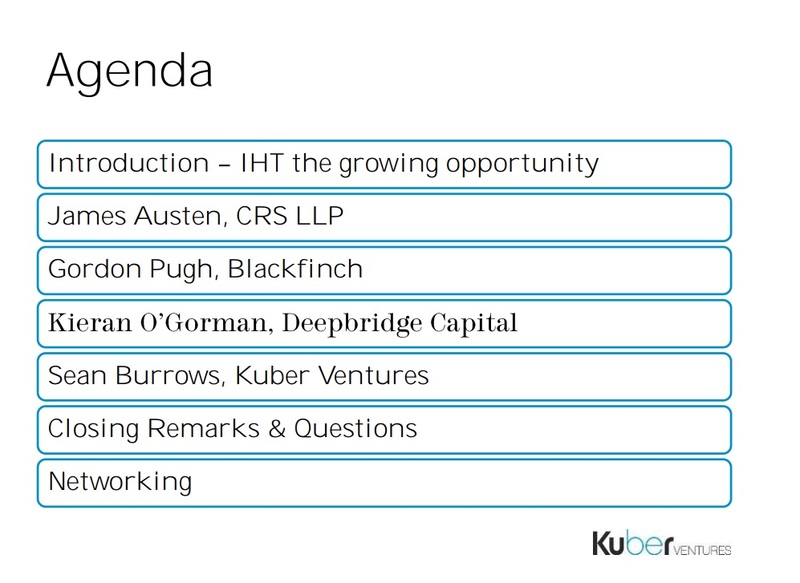 Kuber Ventures IHT seminar was a resounding success. Strong feed back was received from the attendees on all the speakers. Our guest speakers included, James Austen – a Senior Associate from Charles Russell Speechlys who provided an insight into, the technical background on IHT, BPR, EIS, tax planning in the current political climate, lifetime estate and tax planning (investment solutions/legal solutions) and BPR-efficient wills and succession planning. Jody Downes, Business Development Director, Mattioli Woods, stated that James Austen ‘Presented with an authority and a depth of understanding’. We were also delighted to be joined by two of our participating BPR Managers Gordon Pugh of Blackfinch and Kieran O’Gorman of Deepbridge who shared with us further insights into their respective product offerings. Nick Earl of Wardour Partners was pleased to feedback that it was ‘an excellent session; good mix of technical and practical info’. For this morning’s seminar slides please click here.